The Jiangmen Underground Neutrino Observatory (JUNO) is a multi-purpose neutrino experiment. The project was proposed in 2008 and approved in 2013. The experiment is located 700-meter underground in Kaiping, Jiangmen City, Guangdong Province in China. 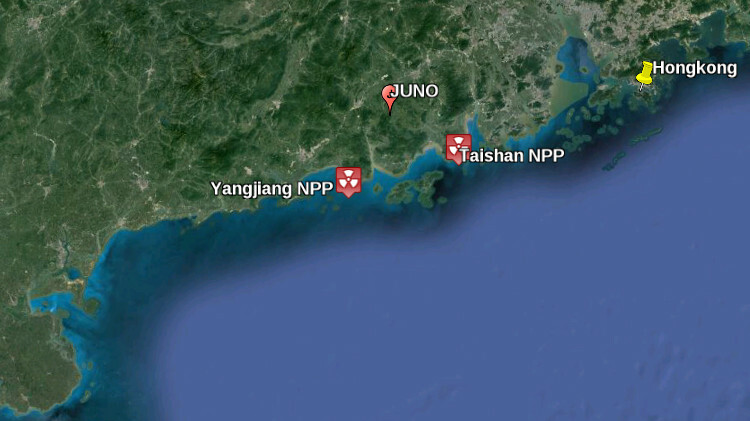 The location of the JUNO detector is 53 km away from both Yangjiang and Taishan nuclear power plants (NPP), which is optimized to have the best sensitivity for mass hierarchy determination. The planned total thermal power of these reactors is 36 GW which would provide sufficient electron anti-neutrinos for the JUNO detector. 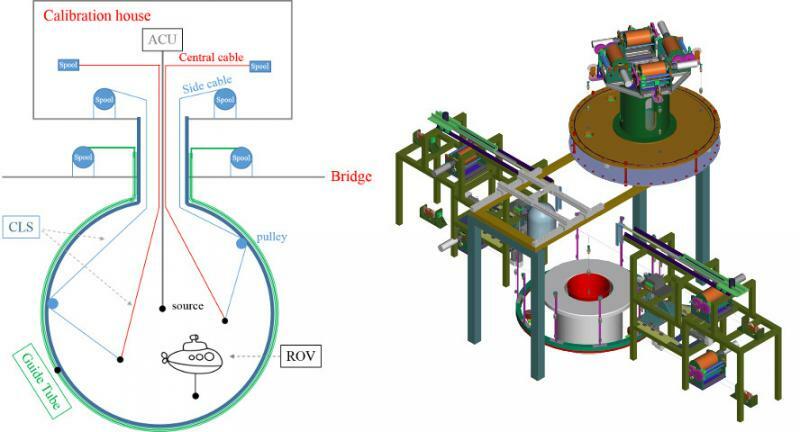 With a 20-thousand-ton liquid scintillator detector with 3% energy resolution at 1 MeV, JUNO is designed to determine the neutrino mass hierarchy (MH) and to precisely measure oscillation parameters by detecting reactor neutrinos. It is also a superb observatory for supernova, atmospheric, solar, and geo-neutrinos, and as well as a site for exotic decay and indirect dark matter searches. The central detector of JUNO is designed as an acrylic sphere with an inner diameter of 35.4 m. The central detector will be filled with more than 20 kton of liquid scintillator. 18000 20-inch PMTs and 36000 3-inch PMTs will be placed outside the acrylic sphere to collect the scintillation photons. The photocathode coverage is more than 75%. 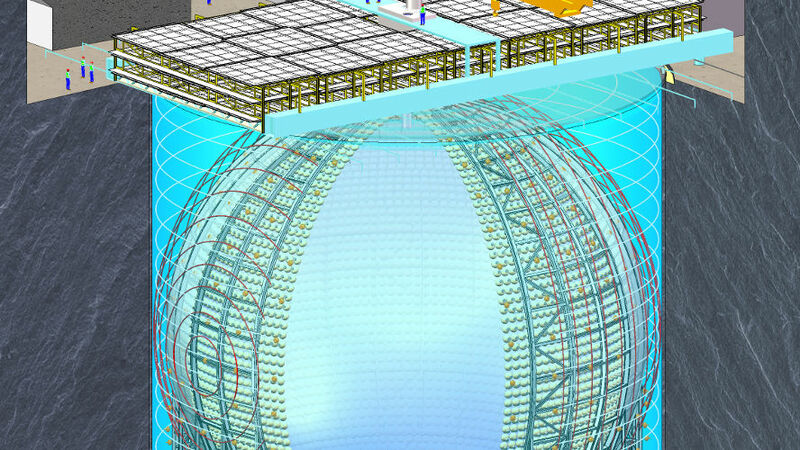 The central detector will be supported by a stainless steel truss and submersed in a pure water pool with 43.5 meter in diameter and depth. Inside the water pool, 2000 20-inch PMTs will be installed to act as an active cosmic ray veto. A muon tracker will be placed on top of the water pool. A central chimney serves as the only penetration to the central detector, which will be sealed by a house containing numbers of calibration devices above the water pool. To reach the expected sensitivity to neutrino mass hierarchy determination, the energy resolution of the JUNO central detector energy resolution is required to be better than 3% at 1 MeV (1.9% at 2.5 MeV where the most signficant MH driven oscillation signal lies), and the absolute energy scale uncertainty to be much better than 1%. 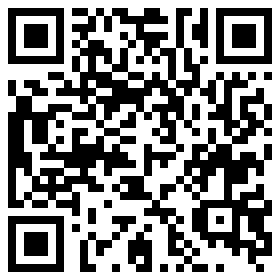 Therefore, calibration of the central detector is critical. Prof. Jianglai Liu from SJTU led the calibration level-II activities, and collaborates with University of Maryland (UMd, led by Dr. Mengjiao Xiao), Xi-an Jiao Tong University (led by Dr. Qingmin Zhang), Northwest Polytech University (Prof. Kai Luo), and Dongguan University of Technology (DGUT, led by Prof. Lei Yang). 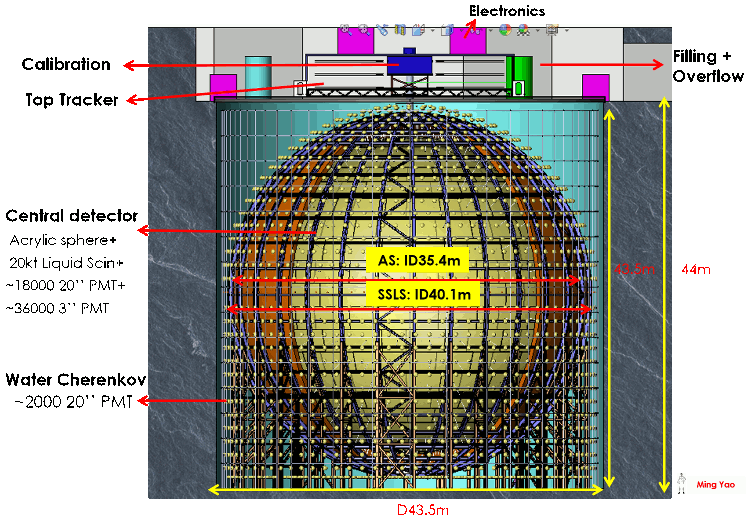 The conceptual design of the calibration system is to deploy multiple sources (radioactive or light emitter) to a wide range of positions inside the detector. The system includes an Automatic Calibration Unit (ACU, UMd) to scan the central axis of central detector, a Cable Loop Systems (CLS) to scan an off-center vertical plane, a Remotely Operated Vehicle (ROV) for a 3D scanning and a Guide Tube (GT) on the outer surface of the acrylic sphere to study the boundary effects. JUNO experiment construction is expected to be completed in 2019 and to commence data taking in 2020. With 20 kton fiducial liquid scintillator mass and 6-year's data, JUNO alone can determine the neutrino mass hierarchy to a 3 to 4-σ confidence level. At Shanghai Jiao Tong University, we explore the secrets of nature by looking for the mysterious Dark Matter Particles, as well as detecting and measuring the presence and absence of Neutrinos.